Some of the most startlingly beautiful places in the world have yet to be explored. If you’re looking to have an off-beat swimming experience that you will never forget, here are seven great ideas that will set your imagination alight. This Austrian beer resort offers everything for the beer-lover and more. There’s your run-of-the-mill brewery offerings like beer tasting, paraphernalia, and beer trivia and of course plenty of opportunities enjoy some amber nectar. Although you also have the unique opportunity to enjoy a beer swimming pool. At Starkenberger 42,000 pints is heated and kept at piping hot temperatures. The proprietors claim that hops in the beer has great therapeutic benefits for the skin. That shouldn’t be a hard sell! Drinking from the pool itself is ill-advised, however you can take a pint pool-side when you’re with friends, just for fun! The Devil’s Armchair is a natural rock pool at the edge of Victoria Falls in Zimbabwe. The Devil’s Armchair is akin to a game of Russian Roulette except it’s you versus nature. When the water levels are lower between September to March, the rock barrier forms a pool where people can swim. However after periods of heavy rainfall or during the wet season, the rock barrier ceases to exist and swimmers have been known to plummet to their death 90 metres below. Rumours abound about the occasional tourist who has fallen into the drop-zone. Located in Micronesia on the island of Pulau is Jellyfish lake. This is a spectacular natural wonder that’s a haven for exotic jellyfish. Swimming with these ethereal creatures is a transcendental and eerie experience. This ancient lake is still connected to the ocean through a series of dark underwater caves. Although the lake is isolated enough that the jellyfish are different here compared to surrounding lagoons. However, the question on everybody’s lips is – Do they sting? Well although the jellyfish have stingers, they are generally too small to be felt by humans. Although people allergic to jellyfish are advised to avoid the lagoon. This was the world’s deepest man-made pool, until this record was beaten by San Alfonso Del Mar in 2007. Nemo 33 still retails the title of the deepest indoor pool in the world at 32 metres. Nemo 33 features highly filtered spring water that’s a balmy 35 ºC. This pool is worthy of a visit for the novelty factor and to learn the intricacies of diving in controlled environment. This is an otherworldly and haunting sculpture garden with a difference. It’s a living and thriving undersea gallery of art that’s mostly inhabited by coral and fish and occasionally visited by humans. Jason de Caires Taylor has created the museum of over 500 sculptures off the coast in Cancun, Mexico. The underwater sculpture garden has been gushed over by travel magazines the world over. It’s described as one of the world’s most uniquely beautiful travel destinations. Vieques Island in Puerto Rico offers yet another unique swimming experience. The water glows by bioluminescence. There’s about 720,000 phosphorescent single-celled organisms that live in every 5 litres of sea water. These organisms react when they are disturbed by emitting a glorious glow in the water. The best time to go there is after dusk. Cradle some water in your hand and witness the plankton floating like fairies before disappearing back into the water. This place is ominously named because of it’s composition; which is inhospitable to most marine creatures. Due to the high salt concentration, people can float around all day in the Dead Sea and don’t need to exert much energy to stay buoyant. The salty water has historically been used in therapeutic treatments. 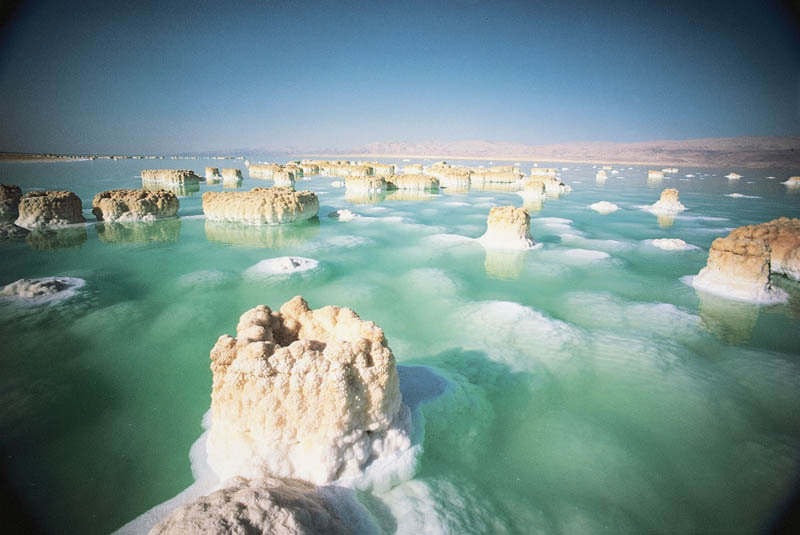 In biblical lore, the Dead Sea was supposedly a place of refuge for King David. Along with being home of the world’s oldest health resort, originally created for King Herod. A kooky fact – the salt from the sea was once used for Egyptian mummification rituals.